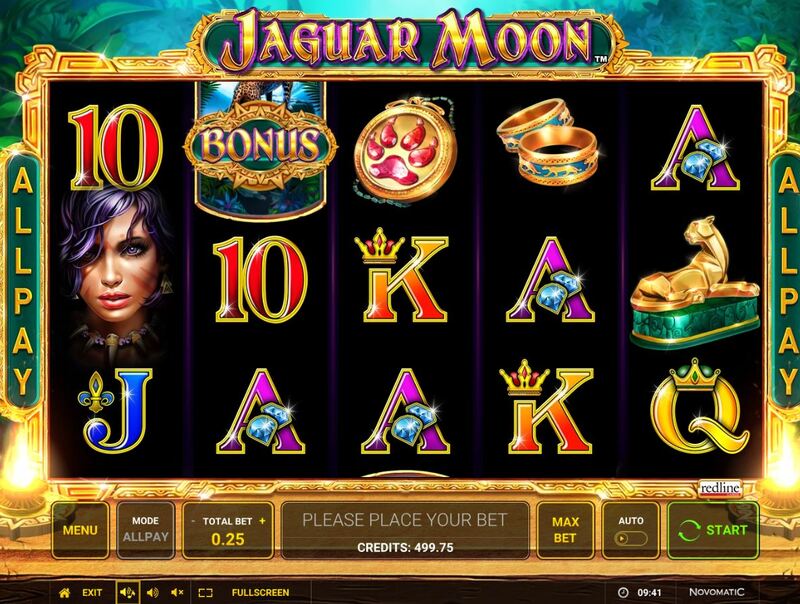 Jaguar Moon slot must have been seen as a sister game by Novomatic for their recently released Jaguar Wild and the same spotty big cat is back again! It's a very different slot this time though and I generally like this theme from South and Central America as do some other developers because we have Aristocrats Jaguar Mist, Thunderkicks Jaguar Temple and IGT's Jaguar Princess, the latter you may have seen in land-based casinos. Anyway, here we get a basic black reel set over a jungle temple background and little sound aside from Novo's trotting sound when the reels stop and a roar if the Jaguar counts in a win - but will he get his teeth into your bankroll too? 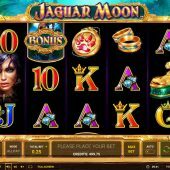 Jaguar Moon has the usual set-up of 5 reels of 3 rows each and we pay 25 coins to spin but actually get 243-ways to win here. Naturally as with most 243-way slots the symbols are single and the 5-of-a-kind values won't be huge - or will they? If you get 5 of the Native Lady you will actually see a very respectable 80x bet, and there's a big gap to the Golden Jaguar Statue at 20x, with the Jaguar Pawprint or Golden Ring at 10x with six card values paying 5 or 4x for the full way of 5 symbols. Wilds are the Jaguar himself which only appear on the centre 3 reels and don't multiply. You have no random in-play stuff going on under the Jaguar Moon, so how about a bonus? There are double-stacked symbols only on reels 1, 2 and 3 which depict the Jaguar standing on some rocks looking out over the jungle and when these appear on the reels, each row visible is then overlaid with 'bonus'. There is a reason we have the scatters like this, because if you land 3 singles you will be awarded with 8 free games with a 2x multiplier, 2-1-1 will award 12 games with 3x, 2-2-1 gives you 15 free games at 4x and finally 2-2-2 will get the best outcome of 20 spins at 5x! This means our best 5-of-a-kind can now pay up to 400x bet.